At a time when North Carolina's population is exploding and its economy is shifting profoundly, one of the state's leading economists applies the tools of his trade to chronicle these changes and to inform North Carolinians in easy-to-understand terms what to expect in the future. Today we are living in a technologically connected age that has completely transformed the North Carolina economy, Walden explains. Once driven by tobacco, textiles, and furniture, the North Carolina economy now thrives on technology, pharmaceuticals, finance, food processing, and the manufacture of vehicle parts. While the state as a whole has benefited from these dramatic transformations, some population groups and regions have not experienced consistent economic growth. Walden identifies education as the key factor; a skilled, college-educated work force, he argues, is now a region's most prized commodity. Walden traces how the forces of the late twentieth and early twenty-first centuries have remade the North Carolina economy, impacted people and regions, and led to the most substantive public policy debates in decades. 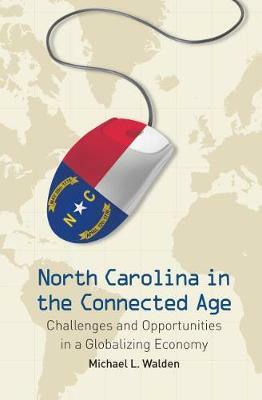 Written in a lively style and including original research and insights, North Carolina in the Connected Age is essential reading for anyone wanting to understand how the state arrived where it is today and what its future might hold.